Not to be confused with Galleom. Galeem, also known as the Lord of Light, is one of the two main antagonists of Super Smash Bros. Ultimate's World of Light mode, resembling a large sphere of light surrounded by seraph-like wings with shifting colors and patterns on them. Its English name is likely a corruption of the onomatopoeia "gleam," often used in contexts relating to light. In the opening, it is commanding a horde of Master Hands against the various playable fighters. However, it then absorbs the Hands, turning into a black hole, and uses them to unleash a devastating attack, which only Kirby manages to escape from. Everyone else is hit with snaking yellow beams of light, which imprison them within the eponymous World of Light, before the beams then continue outwards and cover the planet, turning everyone else into spirits. Galeem has a dark counterpart, known as Dharkon, who plans to engulf the universe in darkness and serves is the primary rival to Galeem. At the end of the game, if players defeat either Galeem or Dharkon separately, they receive a bad ending. If Dharkon is defeated, Galeem incinerates its counterpart and engulfs all of reality in light, leaving a blank screen. If Galeem is defeated, Dharkon imprisons it in chains. By balancing light and dark in the final area, however, and enlisting the help of Master and Crazy Hand, both Galeem and Dharkon can be faced in the true final battle. Galeem attacks the player during the platforming section of the final battle, moving across the screen with two spinning discs made of its wings. It can be repulsed by attacking its core. After the player defeats all of the mode's previous bosses, the player engages in the final phase, where both entities fight each other and the player simultaneously, with them even attacking each other directly if one becomes incapacitated. In the true ending, both Galeem and Dharkon fall into a large body of water and explode, allowing all of the Spirits to go free. Once players beat the true boss fight, they earn legendary spirits of both Galeem and Dharkon. Galeem's spirit has no slots, but comes with a unique ability called "Bane of Darkness", in which damage towards and received from enemies controlled by darkness get doubled in Adventure mode. 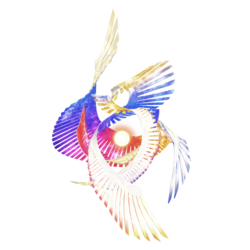 During its boss fights, Galeem mainly attacks by forming weapons from its wings. It is damaged by attacking its core, which moves around the stage. It may form three, later four, drill-like weapons from its wings and slam them into the ground. It may also create a blue orb of energy and fire it into the center of stage where, it splits into three or four smaller orbs that home in on the player. Another attack consists of Galeem creating a multitude of lines crisscrossing the screen. Laser beams will appear along these lines, damaging the player. Galeem can also create three or four small floating mines that explode in a plus formation similar that of an X Bomb. It can split its core into three and shoot a barrage of fireballs at the player. It can also teleport around the stage similarly to Master and Crazy Hand. When its health is about halfway depleted, Galeem will be stunned, its wings disappearing and its core falling onto the ground in the middle of the stage. Following this, Galeem will become angry, its core glowing more brightly. It is now capable of creating bright blue versions of fighters which attack the player before exploding after a short time. When it has very little health remaining, Galeem will be stunned again. In the second fight at the end of the game, Galeem has two new attacks. It can now create waves of light on the sides of the screen with a gap between them. The waves have no knockback, but can deal damage even through shields. It can also create two to four eye-like lights that emit shockwaves across the screen. Its blue orb attack now creates more smaller orbs. When battled alongside, Dharkon, Galeem's wave attack is now horizontal and is operated in cooperation with Dharkon's dark waves. Galeem and Dharkon can be harmed by one another's attacks. When Dharkon is stunned, Galeem will attack its counterpart by forming a blade out of its wings and stabbing it. Sometimes, both bosses will disappear, leaving two puppet fighters each. When defeated in the final fight, Galeem will release a shockwave of energy that deals significant damage and knockback. Kīra From 「きらきら」 (kirakira), the onomatopoeia for glistening, or 「煌めく」 (kirameku), meaning "to glean"
Spanish Lúmina Latin word for luminous. Siyan From сиять (siyat'), "to shine". ↑ Nintendo. (November 20, 2018). Super Smash Bros. Ultimate - Overview Trailer feat. The Announcer - Nintendo Switch. YouTube. Retrieved November 21, 2018. This page was last edited on February 19, 2019, at 14:45.